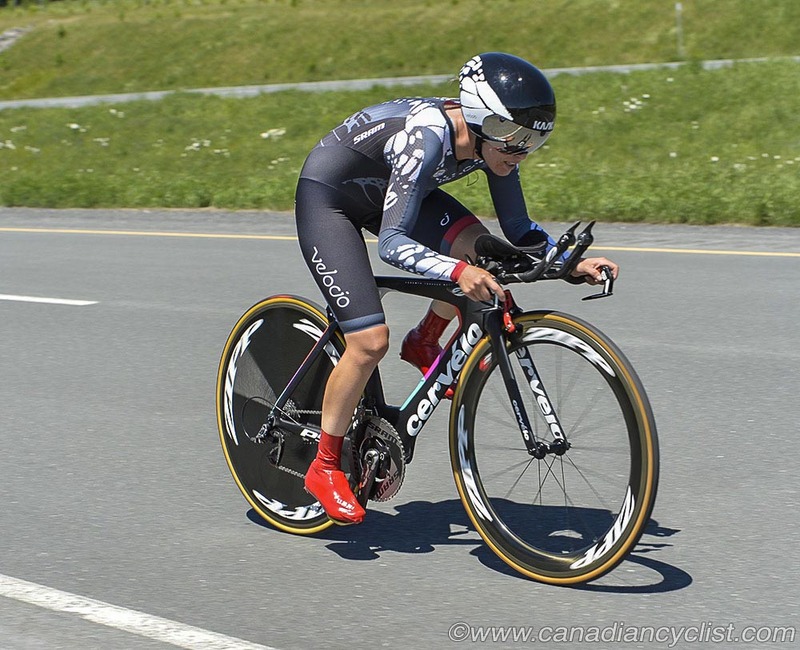 The Canadian National Road Championships opened on Thursday in Saint-Georges, Quebec, with the Individual Time Trial competition. Both Elite champions were first time winners in the elite category, with Hugo Houle (AG2R la Mondiale) and Karol Ann Canuel (Velocio SRAM) taking the men's and women's titles. The course - 30 kilometres for women and 42 kilometres for men - featured multiple long rolling climbs, plus tough, gusting winds that pushed the riders around. Held on a new, unopened highway, riders had a perfect surface to race on. Karol Ann Canuel, a member of the world champion Team Time Trial squad of Velocio SRAM, came into the women's race as the favourite, and she did not disappoint, taking her first national title with a dominant performance. Optum riders Jasmin Glaesser and defending champion Leah Kirchmann took the remaining two podium spots, but were well back, with Glaesser at 1:17 and Kirchmann at 2:03. Alizee Brien (TIBCO) was the top U23 rider, finishing fifth overall. Canuel showed flashes of her form at the Chrono Gatineau earlier in the month, finishing second to Carmen Small (2016 p/b Sho-Air) by eight seconds, but clearly continues to improve after a serious injury from a crash at the Road World Championships last fall that left her with a broken pelvis. "This title was a big objective for me this season," explained Canuel, "and I am really thrilled to be Canadian Champion in the Time Trial. My progression really took off when I joined Specialized-Lululemon last year and Velocio-SRAM this season. I believed in my ability to time trial, and I knew I could do well today. It was such a hard course and I had to push right until the end." Houle took advantage of the absence of nine-time champion Svein Tuft (Orica GreenEDGE) to score his first Elite title, holding off Ryan Roth (Silber Pro Racing) by 26 seconds to win. Tuft's team mate, Christian Meier, was third one minute and six seconds off the pace. Alex Cataford (Silber Pro Racing) won the U23 title, finishing sixth overall. Houle came into the race as the favourite, after a series of strong time trial rides earlier in the season in Europe, plus racing the Giro. However, Roth, who finished second on a shortened version of the course less than two weeks earlier at the Tour de Beauce, kept the race close. Houle established a 15 second lead quickly with a fast start, but then could not back off as Roth kept the pressure on. "I opened very fast, but Roth was quicker than me on the downhills, I think," explained Houle. "I think I was a little stronger on the uphills, but it was hard, very hard out there all race. The fact that Svein was not here was a great opportunity. I had a target on my back today, and I wanted to rise to the challenge. I self-imposed on myself a great deal of expectations today, and I am happy to have delivered." Houle also revealed that Tuft had sent him an e-mail before the racing urging him to keep the national jersey on a WorldTour team so that it would be seen in Europe, adding to the pressure.